- See more at: http://blogtimenow.com/blogging/automatically-redirect-blogger-blog-another-blog-website/#sthash.s1ipfCM1.dpuf CatholicTV: You’ve heard about our 3D videos, now hear about everything else that’s happening at CatholicTV! You’ve heard about our 3D videos, now hear about everything else that’s happening at CatholicTV! CatholicTV connects with viewers via social networking sites. You could say we are getting around! CatholicTV recognizes that people need ready access to faith resources throughout the day and in a variety of places. For that reason CatholicTV has developed a state-of-the-art broadband TV network where daily and Sunday Masses are available in full screen and on-demand – FOR FREE. The Mass is the “source and summit” for Catholics and CatholicTV strives to make this available on every device. The Mass is available on-line, via a free download from iTunes and is broadcast throughout day. Sunday Masses originate from Boston, San Antonio (Spanish) and The Basilica of the Sacred Heart at Notre Dame. The rosary, a popular scriptural devotion is also available daily. 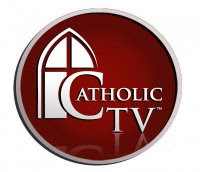 Viewers can tune into the CatholicTV You Tube Channel http://www.youtube.com/user/CatholicTV or watch on a variety of cable carriers throughout the US. Throughout the day CatholicTV staff members update Twitter with the happenings which take place in the Boston area studios http://twitter.com/CatholicTV . One of the most popular social networking sites for individuals and organizations is Facebook; viewers can register as fans at CatholicTV’s Facebook page.